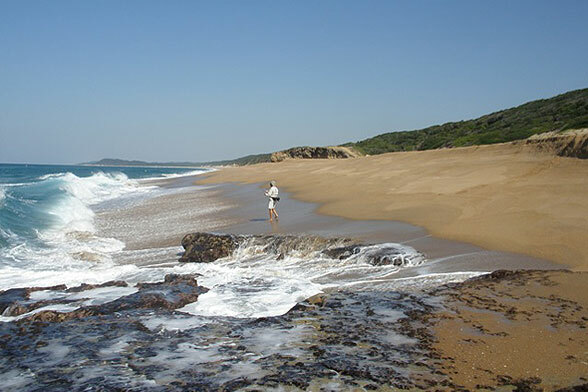 On the northeast coast of South Africa, one of the longest and most beautiful beaches in the world runs unbroken for 150 km between the inlets of the St. Lucia and Kosi Estuaries. 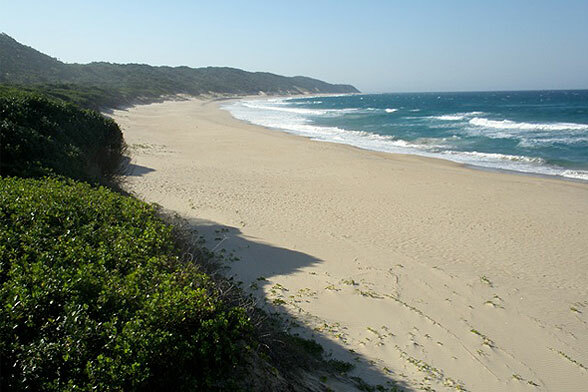 It is entirely within the iSimangaliso Wetland Park, a UNESCO world heritage site since 1999. The beach of coarse quartz sand is backed by a high forested dune that reaches heights of over 100m. 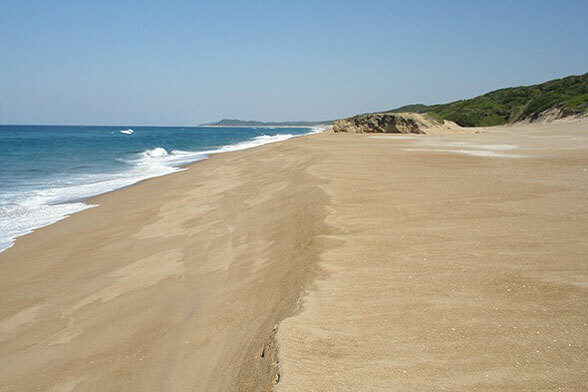 At several locations along the coast are small rocky headlands made of the cemented remnants of Pleistocene dunes and beaches. 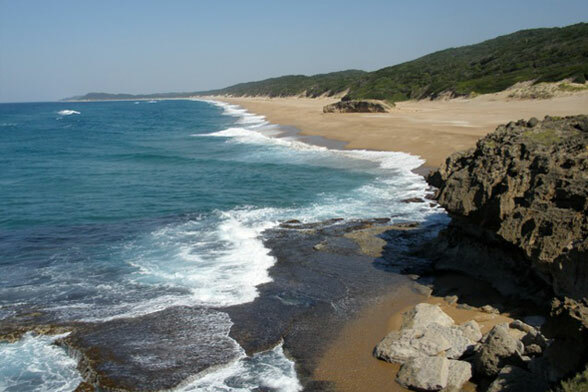 These rocky remnants are also found submerged and they have provided a suitable substrate for the growth of coral reefs on the KwaZulu-Natal coast. Onshore, these are the only solid rock outcrops on the coast. Black Rock (27o04’S; 32o50E) is one such rock outcrop, south of the Kosi Bay Nature Reserve. The large southerly swells on the south side of Black Rock produce a coarse sandy beach that is very steep (the finer grains of sand are kept in suspension and are not deposited). Plunging waves break close to shore and there is very strong swash up the beach. North of Back Rock the beach is locally sheltered from the dominant swells and is made of fine-grained sand. Wave energy is also lower because the waves are refracted around Black Rock. 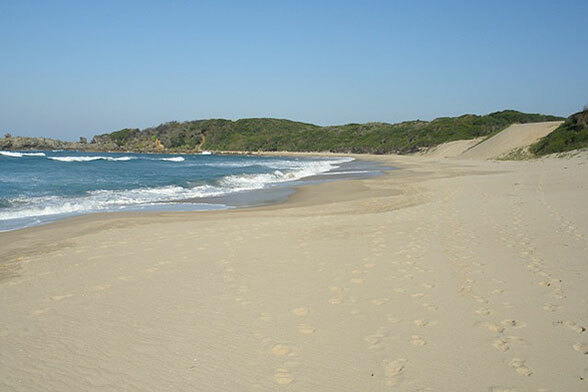 The beach is more gently sloping and is a favoured swimming spot. Black Rock changes the plan shape of the beach by acting as a headland, and a typical zeta bay (or fish-hook-shaped) bay occurs to the north of it as the beach adjusts its shape to maintain equilibrium with the wave energy. Although it acts as a barrier to wave energy, the rock does not stop wind-blown sand from moving north. A “headland-bypass” dune carries this sand from one side of the rock to the other. This usually means south to north, but occasionally, the wind blows in the opposite direction, reversing the transport path. Being the only rock outcrop for several kilometres, Black Rock is home to a lizard that is not found anywhere else in Africa, although it is found in Madagascar and the Seychelles. It is variously known as Coral rag lizard, or Bouton’s snake eyed skink or Cryptoblepharus boutoni. It seems that the ancestors of the present population must have arrived on driftwood carried by the Agulhas Current and have survived only on Black Rock. 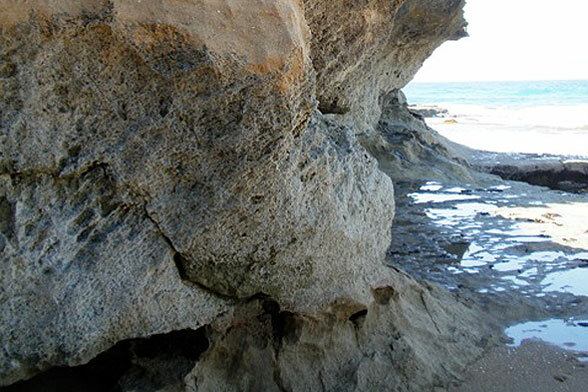 There it outcompetes the local lizards by living among the salt spray, but is unable to leave the rock because of competition from the local lizards.